Are you looking for best Bluetooth Headphones with Boom Mic? ...and you need a solution that can save the work to stick your smartphone to your ears. A bluetooth headset with boom mic; helps your voice to sound crystal clear compared to a inbuilt mic. …headsets looking exactly same like the one mentioned here pops up. I found at least 4-5 same models listed under different generic brands. Moving on… let’s us talk about the headset, though being manufactured in a large scale Chinese factory; it isn’t all that waste after all. Featuring Bluetooth 2.1; this headset can easily be paired with any of your smartphones like iPhone 6/6S or Samsung Galaxy S6/S6 Edge or tablets like Apple iPad Air or iPad Mini. Mic looks very generic to say the least, and the one we are used to seeing on cheap PC headsets. The company claims the mic to be noise cancelling and can cancel out 4 times the more noise than any other generic boom microphone without noise cancelling functionality. Since it features an on-ear design; it comfortably sits on your ears. …the buttons are made of very cheap quality to say the least and provides a not-much-appreciating feedback. You can roam with this headset with a range of 30ft. that basically amounts to 10 meters at least. …which provides a talktime of 12 hours on full charge and standby time of 250 hours. Considering the brand and price; this headset performs well when it comes to voice chat, however don’t make the mistake to use these to listen music… as they aren’t meant for it. 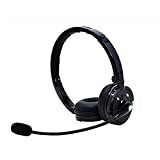 Hope I have informed you that this headset works only with smartphones and tablets, and not with PC or Mac as it doesn’t has any Wireless Receiver. "If you want a solution that is lighter on your pocket and just get’s the job done… go for it or else see the other options we have below." Corsair is a brand synonym with PC components and peripherals and the Corsair Gaming H2100 is of it’s better product. advanced unidirectional noise-cancelling microphone. Please refer the User Manual and Quick start guide before use. …rather it’s targeted for gamers. It doesn’t features Bluetooth; it comes with Wifi technology with frequency of 2.4GHz. Hence mobile and tablet users might want to give it a miss. Now this headset comes with USB cradle where the USB receiver can be connected, and the cradle then connects itself to the PC. Pretty complex I think; when all they could do is… let the USB receiver directly be connected to the PC. The Corsair Gaming H2100 features an over the ear design; where the earcups covers entire ears, making these easy to wear them for multiple hours. Ear cups are rotating and swivel 90 degrees so that you can keep these flat on a desktop. Left ear cup features a noise cancelling microphone; also it features a roller volume control and micro-USB port for charging via USB. One feature I liked about this headset is the rolling volume control; it plays a crucial role when playing fast and quirky game which require quick action. The roller helps in providing proper feedback while scrolling; also helps the gamer to not keep fidgeting with volume controls and stuff. On a full-charge; the headphones runs at a max of 10 hours. "For the price; they are definitely a great buy for any gamer who doubles up to use Skype or online voice calling and also wants to double these up to listen to music and movies… However don’t expect these to produce audiophile grade like quality." One additional feature is; when the battery is down, you can still use these while keeping them on charge; previously mentioned Plantronics Audio 995 does works when kept on charging. This however removes the wireless functionality… but your game keeps going on. Plantronics Audio 995 is a wireless USB headphones with boom mic. …which means the microphone suppresses background noise; so that the person on other side hears your voice and nothing else. Since it comes with a Bluetooth adapter; you can use it with PCs and Mac for gaming, Internet Calls, Skype and Gaming. …this headset doesn’t has Bluetooth. You cannot use it with you smartphone or tablet; for that you need to connect the headset to the micro-USB port on your smartphone or tablet to listen to music. It is mainly meant for people who do online calling, play online games and listen to music. …the Plantronics Audio 995 produces great sound quality which is much better for price; the company is asking. …hence when you are listening to music or playing games and someone comes to talk to you in between, you do not need to remove the headset or keep fidgeting to tap the mute button. You need to keep the mic down when listening to music or whenever the mic is not required. This can get irritating pretty fast; to see a stick down your mouth even when it’s not required. A big no-no when you’re watching movies using this headset. However it’s still a small price to pay for people looking for wireless headsets for PC. "Without Bluetooth functionality; the headset aren’t that usable when paired with smartphone or tablet… this being the only con, the Plantronics Audio 995 are great considering the price-to-performance ratio." The Logitech H820e is probably the most costliest Bluetooth wireless headphones with microphone in our list. It is a business oriented Bluetooth headphones with mic model which is specificially meant for people who are always on their cellphone talking with other people. This saves the work of keeping your hand on your ears while holding your smartphone. …the company offers a wireless range upto 100 meters and a 10 hours of battery life. …this helps the other person hear your voice crystal clear without any disturbance and background noise. Talking about the headphones; they have an on-ear design with slight swivel. Just pair your smartphone or tablet with Logitech H820e via Bluetooth and you’re good to go. However when it comes to PC connectivity; the company provides a ‘charging cradle’ which also acts as wireless connector to your PC. The charging cradle is connected to your PC via a USB cable which acts as a receiver too. However the charging cradle requires an AC outlet connection to charge itself which isn’t convenient; being the cradle can take charge via the USB too. You can then dock the left side of your Bluetooth headphones with mic into the cradle and it starts charging. "I can say; as a complete package for a one-dimesional use of calling and chatting, the H820e serves its purpose very well; however the premium you pay to use is just too much." …however listening to music or movies isn’t a pleasure as it isn’t meant for it and the quality is rather disappointing for a headset that costs just around $150. With a thousands of reviews and answered questions on Amazon; the Logitech H800 is the most popular Bluetooth Headphones with Boom Mic in our list. 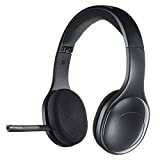 These are an on-ear type of headphones with a soft fabric-like padding; along with a 120 degree rotatable mic. The mic slides out when you want to use and hides behind the headband which gives it a non-obstructive design. Whereas the left side doesn’t features any button; however the battery is located on the left side and also has storage space for the nano receiver; that can be connected to your PC. Hence this Bluetooth headset with boom mic can be used with PC (via the nano-receiver) and with Mobile/Tablets via Bluetooth Pairing. Logitech claims that the H800 can receive signals with a range of 40ft. or 12 meters when connected via nano receiver to the PC or Bluetooth connectivity via Smartphones/Tablets. At the bottom of the ear cans; there’s a micro-USB port that’s only meant for charging; also a toggle button for fast-forward and fast-backward while playing songs or watching movies. Also included is a toggle for Power Off, Bluetooth Connectivity and Nano Receiver Connectivity. Choose the Nano Receiver Toggle. The claimed battery life is 6 hours on a full charge. …and the plastic keeps making the clacking sound while adjusting the headband or while keeping them on your desk. "For the price; the company offers tons of features… just the built quality could have been better. However for the price asked; Logitech H800 offers tons of features and portability which is why we choose to keep this Bluetooth Headphones on First Position." With a very less portfolio of Bluetooth Headphones/Headsets with Boom Mic; it's good to see that there are some contenders which offer great features for the price. ...however listening to music; isn't a favorable choice via these headset. If you're in a sudden need of such headsets, hope this article helps. Why not consider sharing it with your friends on Facebook, Twitter and Google+.